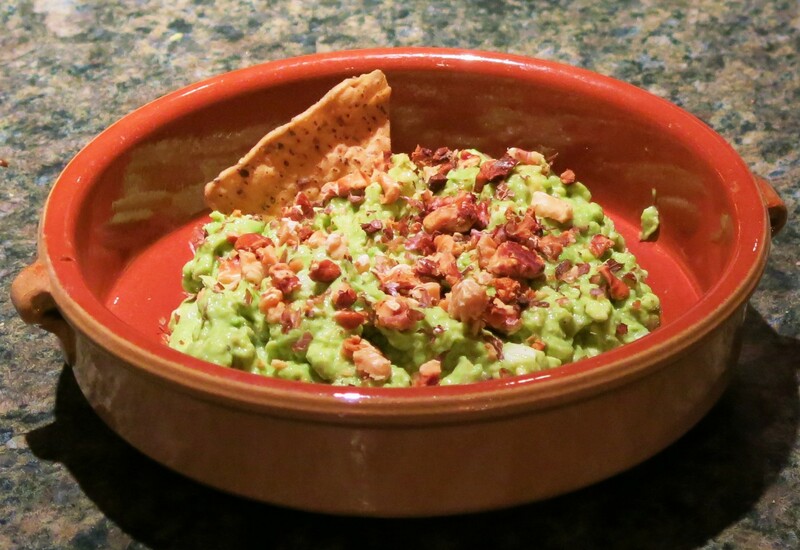 Everyone seems to love guacamole, because well, it’s good. This version has crumbled bleu cheese stirred into it and it’s topped with bacon bits and toasted walnuts. Bring on the tortilla chips! Guacamole is only as good as the avocados you buy. I prefer the Haas avocados to those from Florida and the Caribbean. Haas avocados have more intense flavor and they are buttery, creamy and just plain good…when you get a good one. And that isn’t always as easy as it sounds. A good avocado for guac, as we refer to it at our house, should have a dull, darker green exterior and yield slightly when gently caressed…please don’t squeeze them. If you knock the little button at the top off, the area underneath should be bright green, not brown. If you have all those things, then your guac will be terrific. To remove the pit, slice the avocado in half, going from stem to stern. Take your knife and whack the pit. You want the blade to stick in the pit, give it a sharp 90° turn and the pit will pop right out. Using a tablespoon, run the spoon around the meat, cleaning out the skin completely. I’ve used 2 avocados here. Now, mash them. I use a table fork to do this, but I just want to break them up. I’m prefer to have a chunkier guac, but make it the way you and yours prefer. I’m sure you’ve noted by now that I’m not giving you a recipe, because you don’t need one to make good guac. For this amount, I add about 2 3-fingered pinches of kosher salt and several grindings of black pepper. I add a couple of tablespoons of very finely minced onion, a squirt if Sriracha or some guajillo chile powder, a dusting of garlic granules, a pinch of ground cumin and a generous amount of lime juice…but more about that later. In this case, I also add crumbled bleu or gorgonzola cheese. The creaminess of the cheese compliments the creaminess of the avocado and the sharpness of the cheese, offers good balance. If you prefer, the cheese can just be crumbled over the top, but I mixed it in this time. Just stir it in. NOW, about that lime juice. If you’re going to make this and serve it immediately, then add it now and stir it in. You will need to taste and correct the saltiness and the sharpness to your liking. BUT, if you are going to serve it later, I put the whole mixture in a container and THEN squeeze the lime juice over the top, lay plastic wrap directly on the guac and refrigerate. When it’s time to serve, pull the guac out of the fridge, let it stand for 20-30 minutes, then stir the lime juice into the guac, taste and correct the seasonings, pour it into a serving dish, top with 2-3 slices of cooked bacon that you’ve crumbled, some finely minced fresh cilantro and some coarsely chopped, toasted walnuts. Get out the tortilla chips and dig in! That’s it. Seriously it is just that easy. Find your own happy place with guac and it changes from time to time and with time of year. In the summer, I add finely diced fresh pineapple and omit the cheese and bacon. Or add tomatoes and fresh basil. We also like this topped with the Mexican Picadillo for a more substantial appetizer or as a main course.